La Jolla, CA – Children with Williams syndrome, a rare genetic disorder, just love music and will spend hours listening to or making music. Despite averaging an IQ score of 60, many possess a great memory for songs, an uncanny sense of rhythm, and the kind of auditory acuity that can discern differences between different vacuum cleaner brands. A study by a multi-institutional collaboration of scientists, published in a forthcoming issue of NeuroImage, identified structural abnormalities in a certain brain area of people afflicted with Williams syndrome. This might explain their heightened interest in music and, in some cases, savant-like musical skill. 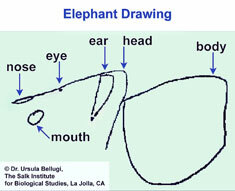 The dissociation between language and spatial cognition in Williams Syndrome is evident in this contrast between the drawing and verbal description of an elephant by an 15-year old with WMS (IQ of 49). The current study is just the latest chapter in a story that’s been unfolding for quite some time – gaining increasing momentum in recent years. It all started when Bellugi reached out across disciplines and assembled a team of experts under the umbrella of a Program Project from the National Institutes of Child Health and Human Development to help her trace the influence of individual genes on the development and functioning of the brain. Identified more than 40 years ago, Williams syndrome arises from a faulty recombination event during the development of sperm or egg cells. As a result, almost invariably the same set of about 20 genes is deleted from one copy of chromosome seven, catapulting the carrier of the deletion into a world where people make much more sense than objects do. “Williams syndrome is a perfect example where a genetic predisposition interacts with the environment to sculpt the brain in unique ways,” says Reiss. “It provides a unique window of understanding on how the brain develops under typical and atypical conditions,” he adds. People with Williams syndrome are irresistibly drawn to strangers, remember names and faces with ease, show strong empathy and have fluent and exceptionally expressive language. Yet, they are confounded by the visual world around them: While they can’t scribble more than a few rudimentary lines to illustrate an elephant, they can verbally describe one in almost poetic detail. “The discrepancy between their engaging social use of language and their poor visual-spatial skills is startling,” says Bellugi. “I am confident that once all the evidence is in, we will have identified genes and pathways in the Williams syndrome deletion that underlie these drastic differences in modalities,” she adds. Despite whole brain volumes that are about 15 percent smaller than normal, the temporal lobe, which lies above the ear canal and, among other things, is involved in processing sounds and interpreting music and language, is of approximately normal volume in people with Williams syndrome. In their study, the researchers tried to answer the question of whether an atypical development of the planum temporale, which is part of the temporal lobe and thought to be involved many auditory tasks, including perfect pitch, may underlie the unusual musical and language skills. First author Mark Eckert, an assistant professor at the Medical University of South Carolina, and colleagues used data from brain scans of 42 individuals with Williams syndrome and 40 control participants to compare the surface folds of the planum temporale. In most people, the structure, a slender inch-long piece of tissue, is larger on the left side of the brain than the right. In people with Williams syndrome, however, both sides tended toward symmetry. “There are different possible explanations: Either the left side didn’t grow enough or the right side grew larger than usual,” says Galaburda. The folding pattern, in particular one groove called the Sylvian fissure, pointed to an increase size of the right planum temporale. But size alone might not explain the unusual auditory strengths of people with Williams syndrome. A more general explanation includes variations in the connectivity of certain brain regions that might contribute to the specific strengths and weaknesses in Williams syndrome. “Relatively subtle developmental defects can have a significant impact on neurological function,” says Dennis O’Leary, Ph.D., a professor in the Molecular Neurobiology Laboratory at the Salk Institute, who studies the development of the cortex and sensory systems. “This exciting work opens the door to develop explanations of how gene networks operating in the developing and mature brain determine who we are and how effectively we behave and perform,” he adds.